Today, T.G.I.F. doesn’t seem to be dramatic enough. I mean, thank freaking ever-loving goodness it is FINALLY Friday. I feel like I am not alone in saying I miss having spring break. For real – there are no words on how much a week off would do my mind/body/soul some good. I guess I’ll just have to settle for planning what to do when I do take my week off! The small victories, right? This week I’ve needed things to be simple. Easy. I mean, not at all complicated. For instance – I find my “Chicken Gyros” recipe to be fairly simple and oh so delicious. Which it is. Unless you purchase and use VANILLA Greek yogurt instead of plain. I will say it did give it a very disturbing unique flavor. So it was time to break out an old friend I haven’t shared with y’all yet! A super light, surprisingly filling, comfort food that’s perfect for Meatless Mondays or just anytime you’re in the mood for it. 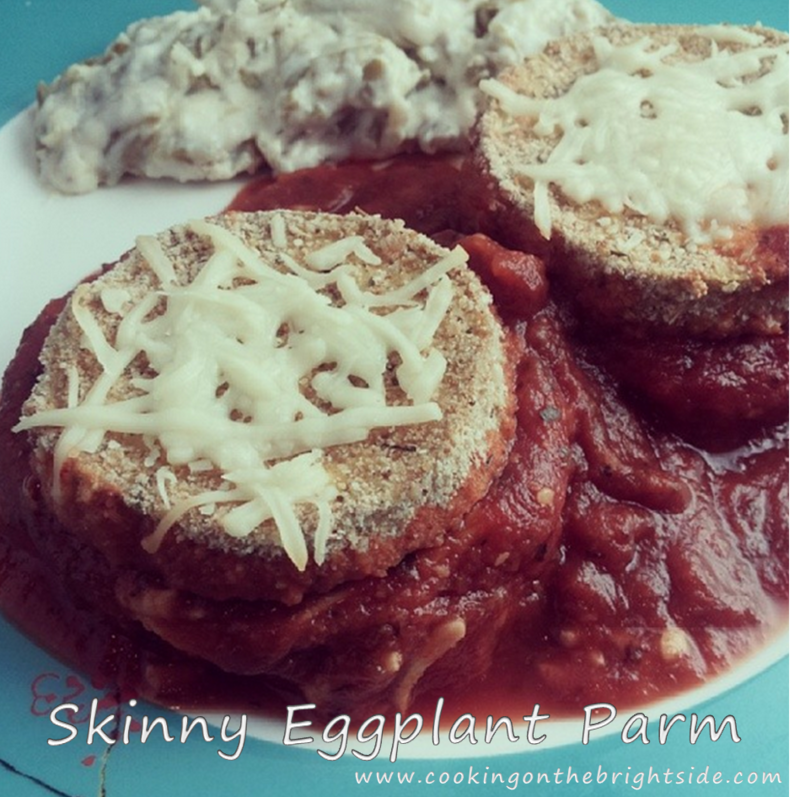 My super delicious Skinny Eggplant Parm. I love ordering this dish in restaurants – but hate knowing how much unnecessary “bad for you” stuff is in it. So obviously, I had to rectify that situation. Give this one a try – it really does fill you up for such a small amount of points. I served this with some green beans and a toasted roll (okay okay, it was a hamburger bun sprayed with butter and sprinkled with garlic salt – I told you I needed simple!) and dinner was only 9 points. Boom. Heat your oven to 350. Line a baking sheet with parchment paper for easy clean up – or just spray with nonstick spray. Set up your assembly station – pour your egg in a shallow dish. 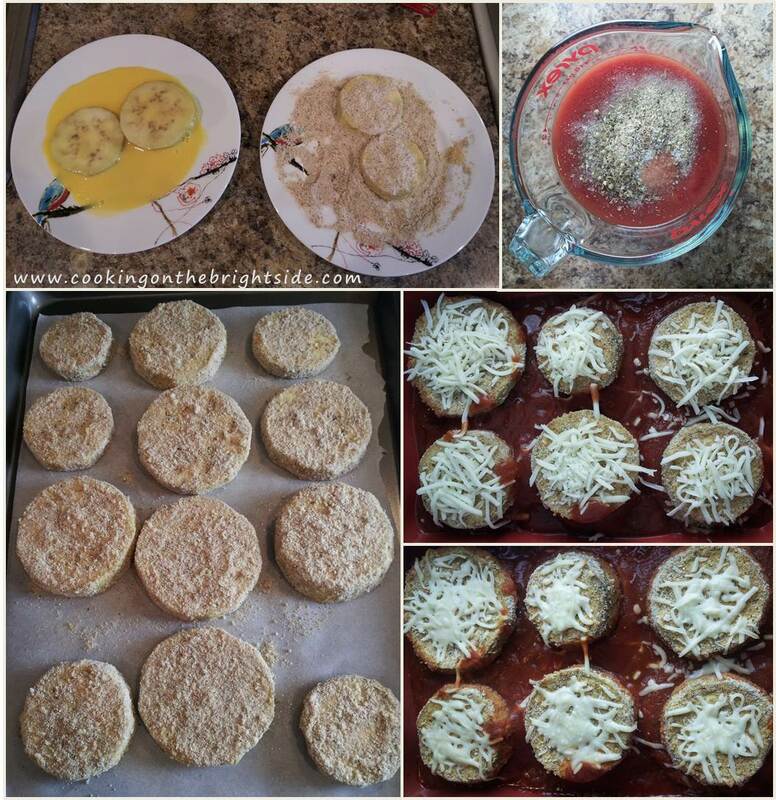 In another shallow dish, mix your bread crumbs, Parmesan cheese, Italian seasoning and garlic powder. Dip eggplant slices in the egg and then dredge in the crumb mixture and add to your parchment paper. Repeat until all slices have been coated. While the eggplant is baking, it’s time to “doctor up” your tomato sauce. I prefer doing this because 1 – it’s lower in WW points and 2 – I sometimes find the store-bought sauces to be too sweet. I just mix in oregano, basil, salt and pepper with a few dashes of garlic powder. Season to your own taste – that’s just a good starting point for me! When the eggplant has finished baking, grease a small casserole dish and pour about 1/3 cup of your tomato sauce to spread in the bottom. 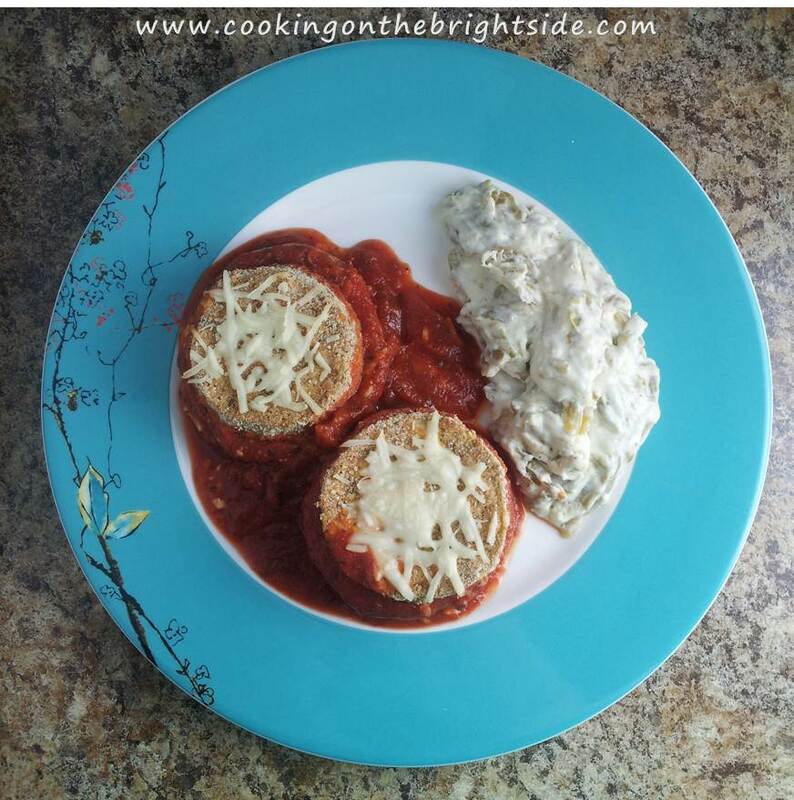 Add half of your baked eggplant slices and top with a little bit of shredded mozzarella. Pour remaining sauce over top and stack the remaining eggplant slices on top. Sprinkle with remaining mozzarella and bake about 15 minutes until sauce is bubbling. Serve and enjoy! Each “slice” is just over 1 point. I had estimated we’d each eat half, for about 8 points – but we ended up being pretty content with just 4 slices for dinner, so I took the remaining 4 for lunch the next day. It was a super delicious and satisfying 5 point lunch!